November 14, 2012 (LD) - Predictably, the Western arranged confab in Doha, Qatar has seen the selection and approval by the US and its allies of a "new opposition coalition" to serve as the face of militants fighting inside Syria. This was in response to overwhelming international condemnation to what has become an open proxy war fought against Syria by Western interests and its regional allies. It is a repeat of the now catastrophically failed NATO intervention in Libya that has left the nation mired in genocidal sectarian and tribal violence, a weak, ineffectual client-regime, and human rights abuses dwarfing in reality, the now confirmed fabrications used by NATO ahead of military operations early in 2011. France and the Arab League have already reapplied their stamp of approval on the "new" coalition, following their support for the same political front they have attempted to prop up for the last nearly 2 years. Beginning at least as early as 2007, the West and its allies, primarily the US, Israel and Saudi Arabia, began quietly organizing, funding, and arming a regional front of sectarian extremists across the Arab World to be used against Lebanon, Syria, and Iran. Exposed in Pulitzer Prize-winning journalist Seymour Hersh's "The Redirection," published that same year in the New Yorker, it was revealed that many of these sectarian extremists were in fact affiliated directly with Al Qaeda. In essence, the West would be intentionally and knowingly funding the very adversaries Western troops had just spent the better part of a decade allegedly fighting in Afghanistan, Iraq, and upon lesser known battlefields in Somalia, Pakistan, and Yemen, as part of the "War on Terror." From the very beginning of the so-called "Arab Spring," armed elements were active in Syria actively seeking to widen what was the final execution of 2007's plans to undermine and overthrow first Syria, then Lebanon and finally Iran. 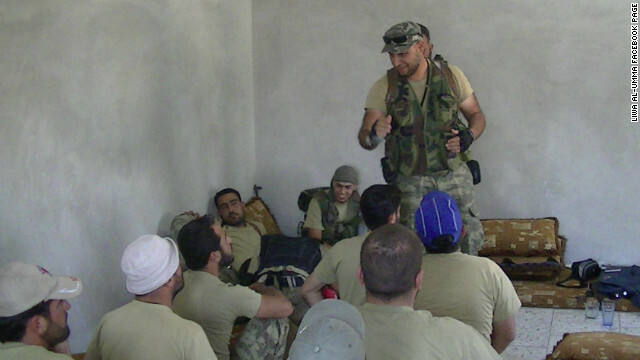 The so-called "Syrian National Council" (SNC), as well as street protests and online activism served as but a smokescreen for what was in reality an invasion of Syria by Western armed and backed foreign extremists sent to augment Muslim Brotherhood militants prevalent in the Dar'a, Idlib, and Dayr Al-Zawr regions of Syria - also coincidentally the "cradles" of the current so-called "revolution." The influx of foreign fighters spiked after NATO had finally succeeded in 2011 at overthrowing the government of Libya and placing into power militants from the eastern city of Benghazi. It was from Benghazi that an overwhelming proportion of Al Qaeda fighters had be sent to fight in Iraq during the US occupation. Like in Syria, the "cradle" for the so-called "Libyan revolution" was also coincidentally the epicenter for extremist activity. In Libya's case, Benghazi served as the center for the the US State Department, United Nations, and the UK Home Office (page 5, .pdf)-listed terror organization, the Libyan Islamic Fighting Group (LIFG). This was documented extensively in the West Point Combating Terrorism Center reports, "Al-Qa'ida's Foreign Fighters in Iraq" and "Bombers, Bank Accounts and Bleedout: al-Qa'ida's Road In and Out of Iraq." The reports specifically identify eastern Libya (Cyrenaica) as terrorist hotbeds, precisely where the so-called 2011 "pro-democracy revolution" also began, and where most of Libyan leader Muammar Qaddafi's attention had been focused over the course of at least three decades, fighting militant extremists. The cities of Darnah, Tobruk, and Benghazi in particular fielded the vast majority of foreign fighters sent to Iraq and also served as the very epicenter for the 2011 violent, NATO-backed uprising. Clearly, the US military and the US government were both well aware of the heavy Al Qaeda presence in eastern Libya since as early as 2007. When violence flared up in 2011, it was clear to many geopolitical analysts that it was the result of Al Qaeda, not "pro-democracy protesters." The US government, its allies, and a the Western press willfully lied to the public, misrepresented its case to the United Nations and intervened in Libya on behalf of international terrorists, overthrowing a sovereign government, and granting an entire nation as a base of operations for the Libyan Islamic Fighting Group (LIFG). The CIA is confirmed to be operating in these areas, allegedly "to help keep weapons out of the hands of fighters allied with Al Qaeda or other terrorist groups," according to the New York Times in their article, "C.I.A. 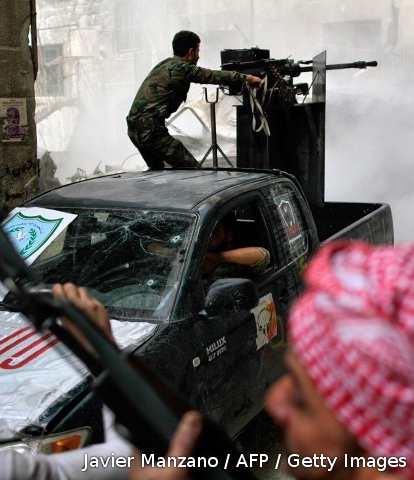 Said to Aid in Steering Arms to Syrian Opposition." Posturing and Threats meant to Weaken/Splinter Syria's Unity. Even as the West postures as if only now weapons will begin flowing to the "new opposition coalition," militants in Syria have been receiving Western backing, funding, and arms through a variety of networks, years before the so-called "Arab Spring" had even begun, and certainly well before this current juncture in the conflict. However thus far, clearly to no avail. The West, primarily the US, UK, and France, its NATO ally Turkey, and the Persian Gulf monarchies of Saudi Arabia and Qatar, are intentionally assisting known terrorists in the overthrow of the sovereign, secular government of Syria - a repeat of the now clearly failed, and already backfiring NATO intervention in Libya. In fact, the exact same terrorists the US claims it is "hunting" in the deserts of Libya for having killed its ambassador, now stand poised in Syria to receive expanded political recognition and military support from the West after this latest round of window dressing in Doha, Qatar. The SNC itself is politically, tactically, socially, culturally, and above all ideologically disconnected with both the fighters in Syria, as well as any legitimate opposition that may exist. While the SNC consists of Syrians, many of the fighters in Syria are in fact foreign militants who hold an allegiance to Saudi Wahhabism, opposed by even many of the current Syrian government's critics - critics who also denounce the SNC and their calls for foreign intervention. The two-pronged encroachment by Turkey and Israel is not the spontaneous response by both nations to an escalating conflict on the ground. Rather it was prescribed, verbatim, by corporate-financier funded policy think-tank, the Brookings Institution, in their report, ""Assessing Options for Regime Change" as a means of increasing psychological pressure on Syria. The prospect of foreign military intervention, or NATO's already depleted terrorist forces succeeding even with increased weapon shipments from the West, is still unlikely. As Brookings indicates, much of what is being done is aimed at psychologically undermining the stalwart defense thus far put up by the Syrian government and its people. The "fear" of possible military intervention and/or the increase in terrorist capabilities is meant to splinter the Syrian population's overwhelming support and unity against what is now clearly foreign aggression, not rebellion. Likewise, the seemingly unstoppable advance of Western aggression against Syria is meant to undermine the support of Syria's allies. Western aggression however has already reached its limits - and while it could embark upon a wider military confrontation with Syria, should both the Syrian people and Syria's allies remain committed to the defense of the nation's sovereignty, not only will this aggression fail, it will create momentum that will roll the West and its extraterritorial interests back significantly, if not entirely. Unity is still Syria's only option.